During those years, Wyrick has worked determinedly during blossom season, collecting soil and water samples for examination in a lab. What changed was the arrival of Kirpa Batth, a biochem major from Sacramento, who enrolled in PUC’s honors program with an interest in hands-on research. When offered the opportunity to partner with Wyrick and Robert Wilson, chemistry professor, Batth jumped at the chance. Typically, plants shouldn’t be able to survive with metals in the soil at the levels at which Batth and Wyrick have found. To get these results, Batth is using a brand new machine, recently purchased with the help of two generous donors for the department of chemistry. The Microwave Plasma Atomic Emission Spectrometer (MPAES) can measure the amount of over 60 elements in many types of samples, and is sensitive enough to detect one part in a billion. The trick, though, is virtually no one has ever used the MPAES in the way Batth and Wyrick are trying to use it. Another challenge to the research is the endangered nature of the plant. 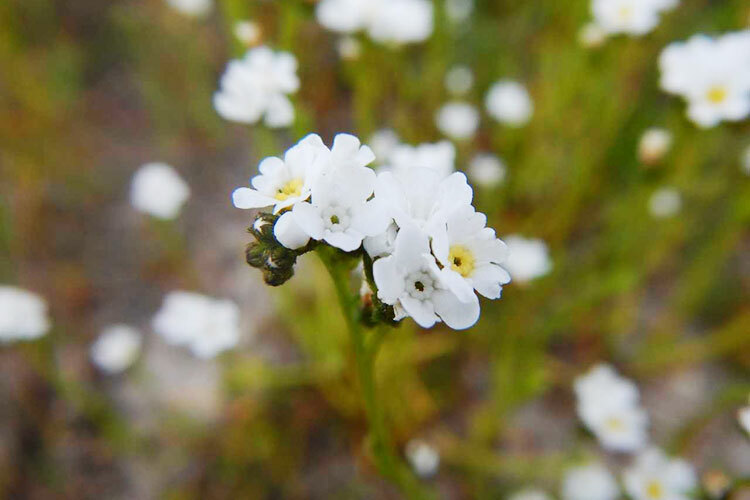 In order to study the flower, Wyrick needs special permission from the California Department of Fish & Wildlife in order to remove samples, and those are strictly limited, as well. Wyrick is required to record and report whatever she collects. One thing the test runs have revealed is the researchers need specific glassware, as there can be trace elements of the substances they’re looking for in the glass, which will affect and skew test results. So once they understand the environment in which the Calistoga Popcorn Flower thrives, what’s next? Additionally, because these plants grow in such unexpectedly adverse conditions, Wyrick hopes they can learn something about their resiliency that can help other threatened plants. Understanding the plant isn’t the only goal of the project, though. Part of the research outcomes are the methods. Though Batth has been passionate about becoming a doctor for as long as she can remember, this project, paired with other lab courses she’s taken, have piqued her interest in biochemistry. She is currently considering a possible future as a forensic biochemist, but is keeping her options open as she explores ideas for her future. Departmental collaboration is an added benefit of this project, as well.